As King Henry IV nears death, warring among the nobility continues: The defeated rebels regroup, aligned now with Northumberland against the crown. Prince Hal’s friend, the aging tavern-brawler Falstaff, is up to his unscrupulous tricks and scene-stealing humor. Hal avoids responsibility for a time but cannot put off the inevitable as his father fades. 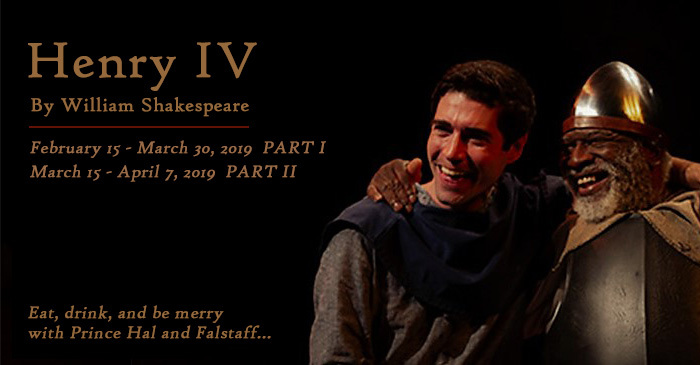 Through Hal’s journey to the throne, Shakespeare invites us to explore themes of family, duty, leadership, succession, and legacy. We are presenting Part Two in repertory with Part One on selected Saturdays. See Henry IV, Part One in the afternoon, go have dinner, return in the evening to see Henry IV, Part Two.